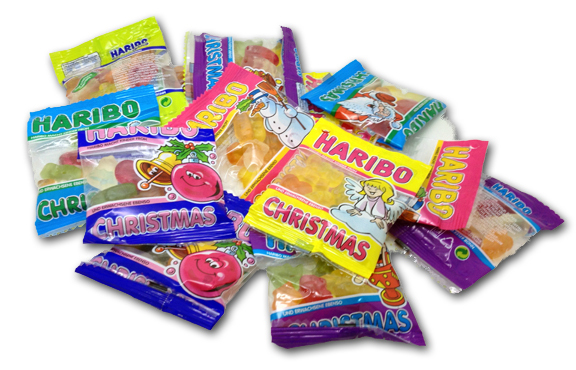 There’s just something so RIGHT about saying that “Haribo Christmas”. I wish it was a made for TV holiday special, or even better, a vacation package. 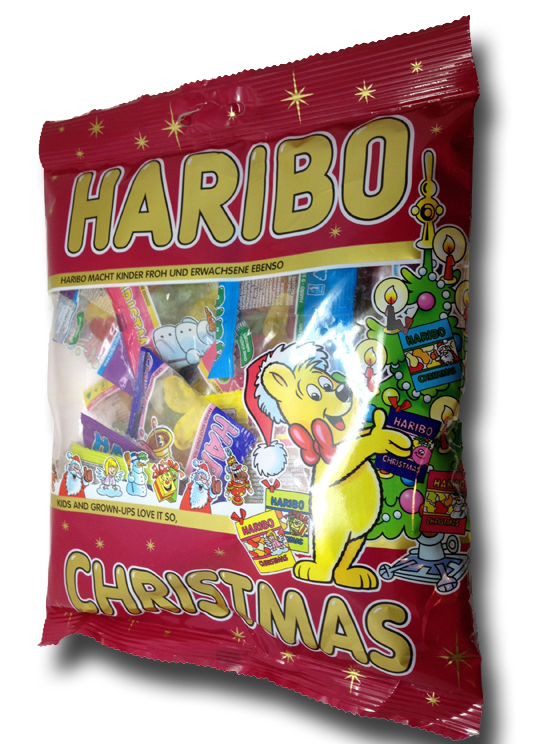 As is though, it’s a huge bag of Haribo’s Christmas themed gummies. And it’s right here that I’d like to make a special thanks to my friend Susie in Germany. I know, I know, I’ve thanked her before, but you people have NO idea what kind of dedication she has. Monthly, if not more frequently, I receive bags of goodies from here, filled with things I never would have the chance to buy over here. And she does it because she wants to, not because I’m bribing her (although I’d like to!) with anything for HER. This really is what this holiday is all about, right? Giving? So once again, I want to make a heartfelt thank you to Susie for being such an uber-fan and cool person. Thanks. Cause let me tell you something….the rest of these shlubs are REALLY slacking in the “let’s send candy to Jonny” department! I won’t go into details, but suffice it to say that I’m very disappointed in the lot of you. who doesn’t want to see this in their stocking? And I’m a JEW! This is the kind of border only candy can cross. Inside the bag we get tons of various colored little bags of joy to dole out to the kids. The colors of the bags don’t seem to have any correlation to the holiday, but they’re bold and pretty anyhow. Inside, the gummy pieces are shaped like candles, doves, bells, moons (moons? ), and of course…little baby Jesus! the flavors are the same as their traditional shaped counterparts, but for me, that doesn’t detract form the novelty of these at all. These are all about kids. Yes, those little psychos running around your house making noise while you can’t hear the game on the tube. But damn it, this time of year is just a good time. We get together with friends and family, and…eat. And eat, and eat, and eat. And there’s always candy around-why is that? It’s because we all love candy. I don’t care who “says” they don’t: they all do. We all do. 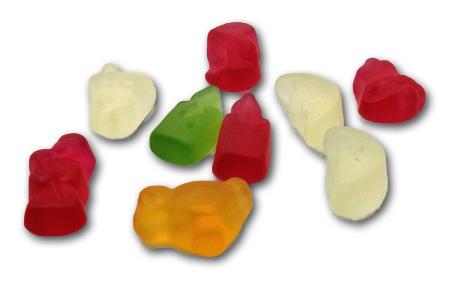 Something like this variety of Haribo really speaks to us, makes us nostalgic, and connects us. Add to that the fact that they’re delicious, classic Haribo, and we have a great product on our hands. So grab whatever candy you have near by, grab one of those germ vehicles running around the house, and give ’em a hug. Then maybe watch “Elf” with them. But now they’re up too late. You’re never gonna get that bike built at this point. Also? Uncle Bert is wasted, someone REALLY needs to put him to bed. Don’t you love the holidays? Thanks Jonny, that´s soo nice of you! Merry Christmas to you, my candy-addicted friends out there!